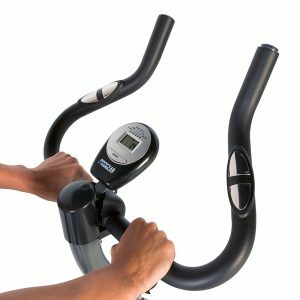 The ProGear 100S Indoor Training Cycle is an affordable entry-level unit that can definitely provide cardiovascular workout experience that is effective. Working out with this unit will be an ideal for those that cannot afford the high-end spin bike such as Keiser M3 Plus Indoor Cycle Bike. It is a sturdy and well-constructed spin bike that is capable of supporting up to 250 pounds weight maximum user weight capacity. It also provides a user with more challenging workouts than one could get from a typical exercise bike. There is also an indication that it has got it own share of popularity because, at time of this review, it has an average of 4.2 out of 5 Amazon customer approval rating after 127 reviews have been summed up. This shows that the majority of its users have approved it and that is a good thing, right? Fortunately, it also includes heart rate sensors that could make it possible for users to monitor and maintain their heart rate zone during a workout which is not commonly available in most other spin bikes of the same price range of under $200. Nevertheless, there are some drawbacks you should be aware of which may or may not be of concern to you but we shall make them known anyway. If you may like to see what other users are saying about the ProGear 100S Cycle Bike then click here to read Amazon customer reviews. This bike is for you if you are on a budget if you are a cycling enthusiast and wish to get a spin bike for home use. Being an entry-level cycling bike you don’t have to expect too much in terms of the features it may or may not possess. But has got enough features to ensure that you are motivated and ready to achieve your fitness goals. The frame of the ProGear 100S Cycle Bike is made of steel even though is a light indoor cycling bike that weighs about 57.7 pounds but however, supports up to 250 pounds maximum user capacity. It is a compact and portable unit with dimensions of 40’’ L x 22’’ W x 46’’ H which also means it can fit perfectly well in small apartments or rooms. The size and weight do not have any negative effect in terms of its stability because it has been confirmed to be stable as long as you don’t exceed the recommended user weight capacity. Users will experience stability during operation without any wobbling or movement issue partly because of the stabilizer bars as well. The steel parts of the frame are coated with gray paint while the seat post has a silver color. The unit is also integrated with transportation wheels that are designed to aid in relocation and storage. The transport wheels are located at the front base of the bike with a small set of wheels. While the stabilizers have rubber caps designed to prevent the bike leaving a dent or scratch on the floor. The ProGear features a seat that is not consistent with most regular basic cycling bike because it is a little wider. Some folks have complained of the seat being uncomfortable but this can usually be fixed by simply buying a gel seat cover that could make the seat as comfy as you want. We are not sure if the seat can be removed and changed entirely as the case with some other cycle bikes. However and fortunately the seat is 4-way adjustable, which means a user can adjust it forward/backward and upward/downward. The implication of this is that taller individuals can be conveniently accommodated. As stated officially by the manufacturer, it can accommodate 5 feet 1 inch to 6 feet 2 inches individuals/users and this claim was confirmed to be correct. The seat can easily be adjusted via two large knobs by loosening and re-inserting into any of the holes you prefer and tighten up to provide the preferred position. The handlebar is not adjustable unfortunately but the seat adjustability has made up for the lack of handlebar adjustability. It is well coated with rubber foam to provide the much-needed comfort when gripped and has multiple grips for different workout postures. The heart rate sensors are also embedded on both sides of the handlebars. It has a simple and effective way of creating resistance which is a direct method of applying friction in order to create a formidable resistance. It basically uses a felt pad which usually comes in contact with the flywheel positioned at the top of the flywheel. 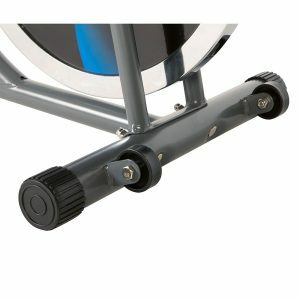 While the resistance knob is positioned on top of the main tube of the frame and can be adjusted by twisting the knob to either give you an easy resistance or a more challenging resistance. It does not have any sort of numbers or levels of resistance but just simply twist the knob for the felt pad to more or less friction depending on the direction you are turning it. You can also workout and pedal in reverse but unfortunately, because of the design of the transmission system you cannot coast just as you could with a road bike but resistance is also effective just as it could when you are pedaling forward. The ProGear 100S Cycle Trainer comes with a chain-drive system that simulates a real road bike. As a matter of fact, sources revealed that it uses chain similar to that of road bikes. Replacement of the chain will be a lot easier because of this. Although, it has a flywheel that weighs about 22 pounds which could be considered to be light compared to what is obtainable with other spin bikes. However, despite the fact that is the case it still provides smooth and quiet pedaling and workout experience. Probably the only noise you can hear is the one that emanates from the chain which is usually not annoying, disturbing or distracting. The flywheel also has this chrome rim design around it that makes it look beautiful and clean even when it comes in contact with sweat, however, you have to make sure to wipe the sweat off occasionally as it does not have any guard on it. It also means that the chain drive will require some level of maintenance just as the road bike’s chain is maintained by occasionally lubricating it with oil and adjusting the tension of the chain if necessary. However, the maintenance frequency will be a lot less than the road bike because the chain is not exposed to dirt, mud, and water. The crankset is very sturdy with strong steel crank arms and basic pedals. Users have confirmed to have been able to perform stand-up pedaling but you must not exceed the recommended weight capacity though. There are no clips on the pedals for spin shoes but do feature toe cages that would ensure that your feet are secured and stable during a workout. The console is obviously basic but can serve its purpose of keeping you motivated and allowing you to track your workout progress. The LCD computer reads out workout data such as the calories burned, distance, time, speed, heart rate and scan. It uses 2 AAA batteries which are also included upon purchase of the machine. The heart rate data is displayed when the sensors on the handlebars are gripped. Like any basic monitor, you will require adequate lights on in order to view the metrics clearly as it is not a backlit type of LCD monitor. The monitor powers on automatically when the user begins to operate or pedal the machine and also automatically turns off while the machine is idle for a couple of minutes. It is very easy to operate as it has only one operational button that is called the MODE button. The button is multi-functional because the LCD can also be turned on by pressing it. When pressed several times it will display the workout data one at a time, but can also use its SCAN function to get the whole workout data to display one at a time rotationally by displaying each value for a couple of seconds then to another and continuously. As aforementioned, to view the heart rate data your hands have to grip the handlebars at all times in order for the machine to be able to transmit the heart rate to the monitor. Or you can decide to monitor your heart rate with separate heart rate chest strap and monitor that is more convenient and more accurate in data display than the contact grip heart rate system. The overall comfort that is provided by the ProGear 100S Cycle Bike is fairly good because the seat has 4-way adjustment capability which can also allow a user to find a suitable and most comfortable setting for a workout. However, the seat itself is something that leaves room for improvement despite the fact it is a bit larger than the regular exercise bike seat. So, a user that feels uncomfortable with the can enhance the comfort by buying a gel seat cover just as suggested above, we are not very sure if the complete seat can be removed and replaced with another. Of course, another solution towards improving the seat comfort is by using padded bike shorts that are designed to be used while working out with a spin bike. The handlebars are not adjustable, however; many can still fit in conveniently because of the adjustable seat. 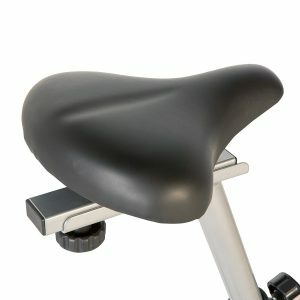 The handlebars are covered with rubber foam that is meant to convey comfort when gripped and has multiple grips that provide different options for comfortable workout posture. It is also a quiet machine that does not have any sort of distracting, annoying or disturbing sound except for the sound that comes from the chain drive which is normal. A user can comfortably watch TV or listen to favorite music while working out and won’t have to be worried about disturbing other people. The ProGear 100S Indoor Training Bike is naturally a compact bike that will not be difficult to store away even for individuals with small apartments or small rooms. A cycling bike that weighs about 59.7 pounds with dimensions of 40 L x 22 W can be moved and stored away by almost anyone. Its transport wheels even make the storage process like a child’s play because these wheels are located at the front stabilizer bar so that the bike can be tipped towards the wheels in order to move the bike easily by one person to the location of storage or workout. It is very safe to tip and moves it but you have to apply caution because one cannot be too careful in this sort of things. However, there could be a problem using the transport wheels on a floor that has soft carpet on it because it could cause the wheels to jam and not run smoothly. Other than that, it can be used on most surfaces. But be careful when using it on a wooden floor because it might leave a dent or scratch on it. It has a light flywheel that cannot provide challenging and tough workout some individual may want. The shipping cost of the ProGear 100S Exercise Bike depends on the retailer you are purchasing from, nevertheless, shipping and delivery by Amazon are totally free. Assembling this unit is pretty easy as the major components are preassembled. You are required to fix the handlebars, seat, post, console, pedals, stabilizer bars, drive and the flywheel. There is also an instruction manual available that walks you through the process of the entire assembly. It will probably take one person about 30 minutes or a little more to have the entire machine all set up. This machine requires some level of maintenance. You need to occasionally clean and lubricate the chain just like the road bike. Reasons being that dirt that comes off from the resistance pad in form of dust somehow settles on it. It is also necessary to wipe the flywheel clean of sweat that settles on it as well because it does not have any guard to prevent that from happening otherwise the chrome rim might start getting eroded over time. If you had read this review from the beginning you would have noticed we mentioned Amazon customer reviews and rating. In overall, the ProGear 100S Exercise Indoor Bike got very positive reviews from the verified Amazon customers. This goes on to show that the unit is worth looking up and probably purchasing if it is the bike with the price range you can afford. The ProGear 100S Exercise Indoor Bike is a basic entry level machine that is good for those that can’t afford high-end spin bikes. It is going to be very useful to individuals that love cycling but do not wish to train for a professional competition or are already advanced in the use of indoor cycling bikes. Reasons being that this unit cannot offer extreme challenging workouts to those that seek that type of exercise or challenge. Its light flywheel of 22 pounds has already limited its capability to do just that but nevertheless, it offers some level of challenging workout that a moderate user will appreciate. And moreover, the price is good and affordable and it is not surprising that the unit has some drawbacks such as the light flywheel. 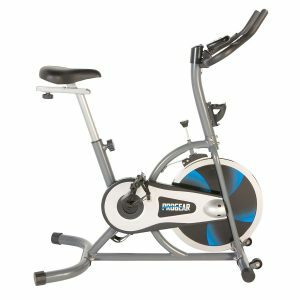 If you are looking for an indoor bike for home use, something that could help you work out and gain physical fitness and you are on a budget, then the ProGear 100S Indoor Cycle Bike is recommendable. It can help you burn tons of calories if you workout hard and vigorously.